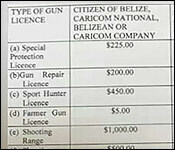 Tonight there is concern amongst gun owners after reports emerged that gun license fees are going up sharply on Monday. 7News has seen a copy of a new fee schedule which increases the fees by as much as 300% in some cases. And, in other cases introduces two or three hundred dollar fees where previously there were none. The new fees were first proposed in September of 2017, and the announcement was that they would be implemented in the coming months. And it seems that they will now be implemented as of Monday. We tried to reach the Commissioner of Police, and the CEO's in the Ministry of National Security this evening but could not get a comment. The idea behind the new fees is to reduce the number of illegal firearms and ammunition on the streets. When the fees were first proposed, the Ministry had said that there will be no requirement for persons currently licensed to pay an increase until their subsequent renewal. I am sure the gang members and other illegal gun owners will rush to register and pay the fee for their firearms. Just another example of penalizing legal gun owners while doing little to prevent illegal gun ownership. So true police cannot protect citizens, so raise the prices to legal owners to support and pad the pockets of GOB even more!! They are just following the crazy logic of their Liberal counterparts in Europe and the USA. No reason to use commonsense. Just remember all the talk a few years ago on this thread about how all the weapons in Belize where coming across the border from the USA. That is until Fast and Furious broke and showed that the government of the USA, namely Atty. Gen Eric Holder was sending them down despite the objections of gun owners and gun shops who complained directly to the FBI about selling weapons to suspicious persons. He then plead the 5th. "Don't worry we are tracking them" Do you think this had anything with furthering their agenda? Little paranoia here. GOB is raising rates and taxes on everything to pay their debts. Fuel went up 3 or 4 times recently and not Eric Holders fault. Notice farm license is still inexpensive? $5.00 for shotgun. Recently read US law enforcement article about how guns and prescription meds are being shipped (or departing) the fulfillment centers to hands unknown and untraceable. Take a look at the guns used here for crimes-mostly old, some just about working, and sometimes, maybe not. Its a mess and few of these stories have happy endings on either side of the coin. If guns are a reflection of our general comfort, we have failed. Yes the GOB is forced to raise taxes, arguably for their corruption an poor management, but to use the failed logic that raising the license fees for firearms will help control illegal use of firearms is disingenuous. There are numerous examples of strict gun laws not having that desired effect - Chicago as one prime example. Preventing criminals from owning firearms and prosecuting the illegal use of firearms is more effective than placing additional burdens on legal firearm owners. People that own firearms and do not break the law are not the problem and placing additional costs and burdens on them will not solve the problems created by those that do not obey the law. Last edited by bywarren; 05/08/18 05:32 AM. I assume most homes I visit have guns and if going on the sea or into the bush with a group of friends, assume at least someone has. I don't ask. I trust them. But can not recall any saving life or property because they had one. Or thwarting an incident because they had one. My crazy logic. Yes, crazy logic. Just because no one with a firearm has had to prevent you from harm does not mean others have not. I am a certified shooting instructor and personally know of people who have been protected from violence by either themselves or someone else owning a firearm. And just to make it more close to home, my fishing guides uncle here in San Pedro was returning from hunting in northern AC a few years back when just before the bridge two people blocked the road and attempted to assault him. They picked the wrong person because he had his legally registered shotgun and put it to good use. Of course there are many other reasons for owning a firearm besides personal protection and it concerns me when restrictions are place on those who legally own forearms that have no effect on controlling the illegal use of firearms. I recall a several years ago before the road north was widened when a few enterprising armed robbers where putting debris across the road and robbing people at gun point until the wrong group of people came along. Some hunters where returning to town unfortunately for the thieves. One thief ended up dead and the other wounded. There was very little trouble on the road after that incident. Then there was the woman who ran down with her weapon in town and stopped the thieves from stealing her boat. She fired one shot which didn't hit them but went into the outboard cover as I recall. She was featured in a article in the paper and praised. There are two that I can think of in a small town. There are many others in the country as a whole. The act of self defense is a God given right as far as I'm concerned. In the USA when seconds count the police are minutes away. In Belize, when seconds count the police are an hour or more away. Yes Jim, that was my guide, Jose Gonzalez, uncle who used his shotgun to protect himself. The thing that concerns me is that there are people who have no desire to own a firearm that are willing to advocate restricting the rights of legal gun owners that have no real effect on illegal gun activity. It might be an extreme analogy, but the logic is the same. There are many people injured and killed by drunk drivers, but because almost everyone wants the ability to own and drive a vehicle, there is no effort to ban or restrict responsible people from owning and driving their cars. When it comes to restricting people's rights, I wish more thought would be given to how that might actually get the desired results. And, to get back to the topic of raising the fees to own a firearm, I would enjoy hearing from anyone who agrees with that how it will help prevent the illegal use of firearms. Last edited by bywarren; 05/09/18 06:10 AM.